Funeral services for Linda Oberhansley, 25, 2614 Cecil Dr., who died May 18, 1970, will be Saturday noon, Holladay Fifth LDS Ward Chapel, 4100 Camille. Friends may call at 260 E. South Temple, Friday 6:00 to 8:00 p.m. and at the chapel Saturday, one hour prior to services. Burial will be at Clinton Cemetery. Linda was born January 1, 1945, Salt Lake City, to Merle Ray and LaRue Mitchell Oberhansley. Linda married Keith Edward Huntsman, February, 1967, Aspen, Colorado, divorced. 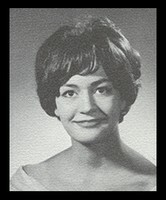 She was a graduate of Olympus High School, 1963. She attended the University of Utah. Linda was a member of the LDS Church. She is survived by her parents, Salt Lake City; her brother Steve and sisters Mrs. Tim (Cheryl) Brown, Karen, and Anne, all of Salt Lake City. She is also survived by grandmothers Mrs. Flora Bowman, Cedar City and Mrs. Lavon Mitchell, Clinton.